The last section of the Purple Line Extension Transit Project, Section 3, will add 2.56 miles of new rail to Metro’s Rail system and connect downtown Los Angeles to the Westside. The two new stations will be added at Wilshire/Westwood and on the U.S. Department of Veterans Affairs property. Section 3 received the approval to move forward by Metro's board in 2016. Currently, in pre-construction, the project is anticipated to begin construction in 2019 and be open for operations in 2026. The Westwood/UCLA station box will be located under Wilshire Bl between Veteran Av and Westwood Bl. A construction staging area is located at the UCLA parking lot north of Wilshire Bl between Gayley Av and Veteran Av. 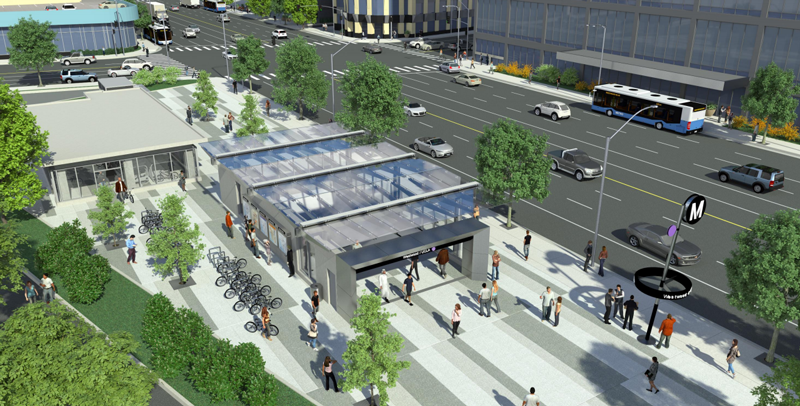 The main station entrance will be located to the west of Gayley Av, which will be equipped with stairs, escalators, elevators and bicycle parking. Other entrance(s) are also under consideration and development. Centrally located in Westwood, the Westwood/UCLA station will provide patrons with access to the Westwood Medical Center, Hammer Museum, UCLA campus and the surrounding Westwood Village. The Westwood/VA Hospital station box, including two crossovers, will be located to the west of the I‐405 Freeway and south of Wilshire Bl. 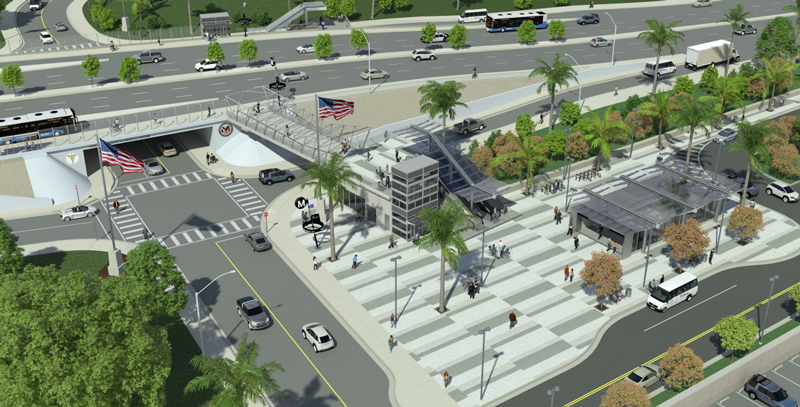 A pedestrian bridge to the south of Wilshire Bl and vertical circulation equipment to the north will enhance patron access to the station entrance from existing bus stops at the elevated Wilshire Bl overpass. The main station entrance will be equipped with stairs, escalators, elevators and bicycle parking. The Westwood/VA Hospital station in West LA will provide a reliable transportation option to the U.S. Department of Veterans Affairs West Los Angeles Medical Center and the surrounding U.S. Department of Veterans Affairs campus, with connections to the westside and its surrounding areas of interest. Metro holds regular meetings to update stakeholders on the project, view the community meeting presentations . View up to date pre-construction notices .